NEW ORLEANS – On a French Quarter morning as subdued as the previous night is unrestrained, the aroma of coffee and fresh baguettes, of beignets and powdered sugar, of a muddy Mississippi river churning its way toward the Gulf, fill the sultry air. But take another whiff. What's that? Something sweet. Something sinful. Chances are, it's the fragrance of melting butter, roasting pecans and dissolving sugar – the unique confectionary creation known as the praline. This cookie-shaped treat – pronounced "prah-lean" – is indigenous to the Crescent City, and you can find the best ones within just a few blocks of one another on Decatur Street. During a few fleeting hours of the morning when this part of the Big Easy becomes the family destination that tourism officials wish it were, we set out to find the perfect praline. Our timing was fortuitous. Not only are most pralines made between 8 and 11 a.m. But since we knew nothing about these Southern sweets, we also needed to bring an expert on candy. Fortunately, our 2-year-old son was available, and we felt comfortable enough to take him along. Our praline adventure began with breakfast at Café du Monde, the tourist favorite where New Orleans doughnuts called beignets and café au lait is served outdoors. Our son made sure we started the day on a high note by blowing the powdered sugar that topped the beignets every which way, so that we had no choice but to inhale it. The only way to get a faster sugar-rush would have been to inject the powder intravenously. Aunt Sally's, conveniently located next door, was our first candy stop. If you can look past the T-shirts and commemorative CDs featuring obscure Cajun artists, you'll discover the best triple-chocolate praline this side of Decatur Street (and that's saying a lot). We did. How are pralines made? The precise recipe is a secret. But the general ingredients are common knowledge. Butter, sugar, cream and pecans – and no preservatives, ever. "Because pralines aren't made with preservatives, they only have a shelf-life of about a week," store manager Bethany Wangler confided. "Of course it goes without saying that the fresher they are, the better. I like to eat them right off the marble." Right off the marble? We asked Ms. Wangler if she happened to have any. "You're too late," she said, sliding a tray of samples neatly divided between original and triple-chocolate praline pieces, our way. Our son tried one of each, and he approved of both. He tried to grab more but we cautioned him to pace himself. A few doors away we found Evans Creole Candy Factory. If it wasn't for the tidy rows of chocolates, candies and pastries protected behind the glass counters, you could be fooled into thinking you were visiting one of New Orleans' antique shops, or even traveling back in time. Evans' confectioner evidently had the day off when we stopped by. The samples tasted a few days old – at least according to our expert – and the woman minding the store couldn't tell us if the pralines were even made on the premises or just shipped over from a factory somewhere else. That's OK. Evans is said to have pioneered the chewy praline, a delectable creation made with caramel, so its place in praline history is secure. At Loretta's, in the French Market, we continued our search for right-off-the-marble pralines. Loretta Harrison, the owner of the candy shop, uses her grandmother's secret recipe to make her pralines. And they come in all kinds of flavors, the most of any we found: coconut, caramel, peanut butter, pina colada, toasted almond, rum raisin, heavenly hash, chocolate and, of course, the original. Loretta's also had the largest pralines – about the size of one of those Cajun music CDs. Our son peered at the marble for evidence of a fresh praline. "Eight-thirty in the morning, that's about when we start to make 'em," said the shopkeeper. Discouraged, but experiencing a terrific sugar rush nonetheless, we stumbled through the doors at Southern Candymakers. Pete Tompkins, the store's general manager, was stirring a fresh pot of pralines. Our timing couldn't have been better. We explained our fantasy of eating warm pralines right off the marble, and wondered if he could help us. "Wait five minutes," he said. We paced the tiny store like celled-up convicts. Our son rapped the counters with his hands, trying in vain to reach the truffles behind them. Gift-wrapped boxes of Creole confections, including chocolate inventions with names such as Bourbon Street Bark and Jackson Squares, were neatly piled on low-lying display shelves. And then, when we couldn't take it any longer, Mr. Tompkins began scooping hot, gooey silver-dollar size pralines in neat rows on a marble slab. When they were barely dry, he slid them on to waxed paper, and then offered us each one. Worth the wait? Oh, yeah. Even though the praline cools quickly, the pecans inside retain their warmth, and the two combined are an inspired combination of nut and sugar, hot and cool, perfectly orchestrated. No exaggeration: The New Orleans praline is one of the seven culinary wonders of the world. Christopher Elliott and Kari Haugeto are freelance writers in Florida. The streetcar is the mode of transportation preferred by residents of the Garden District, Uptown and Central Business District. A single ride costs $1.25. Visitor's passes are $5 for a one-day pass and $12 for a three-day pass. There are discounts for senior citizens, and children younger than 2 ride free. Aunt Sally's Praline Shop, 810 Decatur St., is just footsteps from the famous Café du Monde. Sally's is known for its unique triple-chocolate confection. Price: $1.55. Contact: 504-944-6090; www.auntsallys.com . Established in 1900, Evans Creole Candy Factory, 848 Decatur St., has the ambience of the old-fashioned confectioners shop. There are two stations for viewing praline mixing and candy making; they're active during the weekends. Price: $1.45. Contact: 504-522-7111; www.evanscreolecandy.com . It's easy to miss the tiny storefront of Southern Candymakers, 1010 Decatur St., on the way to the French Market. Fresh pralines are prepared throughout the day. Price $15.95 per pound or about $1.25 a praline. Contact: 504-523-5544; www.southerncandymakers.com . The largest pralines in town are at Loretta's Authentic Pralines, 1100 N. Peters St., Suite 17, in front of the entrance to the French Market. Try the peanut butter or coconut pralines. Price: $1.82. Contact: 504-529-6170; www.lorettaspralines.com . The Audubon Zoo, 6500 Magazine St. is a 30-minute ride from Canal Street. Open 9 a.m. to 5 p.m. daily. Closed Christmas, Thanksgiving, Mardi Gras and the first Friday in May. Admission is $11 for adults; $6, children 2 to 12; and $7, seniors. Contact: 1-866-487-2966; www.auduboninstitute.org . Louisiana Children's Museum, 420 Julia St., is in the historic Warehouse Arts District. Open 9:30 a.m. to 4:30 p.m. Tuesday through Saturday, and noon to 4:30 p.m. Sunday. During summer, visit 9:30 a.m. until 4:30 p.m. Monday. The museum is closed on major holidays. Admission is $7 for adults and children; younger than 1, free. Contact: 504-523-1357; www.lcm.org . Audubon Aquarium of the Americas, #1 Canal St. at the Mississippi River, is open 9:30 a.m. to 6 p.m. Sunday through Thursday, and 9:30 a.m. to 7 p.m. Friday and Saturday. Admission is $15 for adults; $11, seniors; $8, children 2 to 11. Packages are available for aquarium, zoo and IMAX visitors. Contact: 1-800-774-7394; www.auduboninstitute.org . New Orleans Convention & Visitors Bureau: 1-800-672-6124; www.neworleanscvb.com . 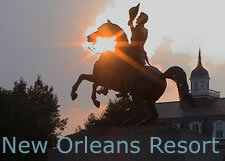 New Orleans Tourism Marketing Corp.: www.neworleansonline.com .